Talk of tariffs and a potential trade war caused March to kick off with a down day and those themes persisted through most of the month. This led to a period of elevated capital market volatility which closed out the first quarter of 2018. The quarter concluded with back-to-back down months for the S&P 500 Index after 15 consecutive months of gains through January. While not spiking to the levels seen in early February, volatility remained elevated in March, and choppier markets have become more consistent after an extended period of calm dominated capital markets in 2017. In the latter part of March, the S&P 500 came close to retesting the lows from the 10% sell-off in early February. Although equity markets recovered from that point, it was not enough to overcome the declines from earlier in the month, and the S&P 500 remained in negative territory to close out March and the first quarter of 2018. The S&P 500 declined about 2.5%, the Dow Jones Industrial Average fell close to 3.6%, the Russell 1000 Index was off about 2.3% and the Russell 3000 Index dropped around 2.0% in March. All four of these indices declined overall for the first quarter of 2018. However, in a reversal from recent trends, small cap stocks, as measured by the Russell 2000 Index, turned in positive results for the month, gaining about 1.3%. It easily outperformed its large cap counterparts, although it too remained in slightly negative territory for the quarter. The NASDAQ Composite came under particular pressure in late March as scrutiny of technology companies picked up for a variety of reasons. Despite this weakness in March, the NASDAQ Composite was one of the few equity indices to post positive gains for the quarter. Growth stocks (as measured by the Russell 1000 Growth Index) declined about 2.7%, which was worse than the monthly drop in value stocks (as measured by the Russell 1000 Value Index), which fell about 1.8%. However, growth stocks were able to post positive gains for the quarter as value stocks declined, which continued 2017’s trend of growth outperforming value. International equity markets declined as well in March as the MSCI ACWI ex US Index, a measure of developed international equities, dropped about 1.8% and the MSCI Emerging Markets Index, declined about 2.0%. Due to strength in January, emerging market equities remained in positive territory for the quarter, but developed international equities were negative over the first three months of 2018. The pressure on bonds eased in March as the yield on the 10-year U.S. Treasury declined during the month. This benchmark yield pierced the 2.95% level in February, its highest since early 2014 and the high point for the 10-year U.S. Treasury for the quarter. After spending most of March trading in a range between 2.8 and 2.9%, late month stress in equity markets drove a flight to quality and the 10-year U.S. Treasury yield closed the quarter around 2.74%. Despite this decline in March, rates have still increased rather dramatically from the end of 2017. Although most bond sectors enjoyed gains in March as rates fell, most also remained in negative territory for the first quarter of 2018. The Federal Open Market Committee (FOMC) had its first meeting under new Federal Reserve Chairman Powell in March and the Fed Funds target rate was increased by another 0.25% as expected. We would still consider this a slow-paced and measured rate hike cycle as the March increase is only the sixth hike to the Fed Funds rate since this tightening cycle began in December 2015. Most pockets of fixed income, especially those more rate-sensitive areas like U.S. Treasuries, advanced during the month, but high yield bonds declined in March. The widely followed Bloomberg Barclays U.S. Aggregate Bond Index rose 0.64% in March and high yield bonds fell by 0.60%. While negative over the first quarter of 2018, high yield bonds still showed better relative performance compared to several areas of fixed income including investment grade corporate bonds, longer-dated U.S. Treasuries, and the Bloomberg Barclays U.S. Aggregate Bond Index. The S&P 500 Index declined in March for the second consecutive month pushing the overall results for this widely followed U.S. equity index into negative territory for the first quarter of 2018. This was the first negative quarter for the S&P 500 since the third quarter of 2015 and stands in contrast to the record highs seen in January, a month that saw the S&P 500 gain for the 15th consecutive month following the presidential election in 2016. Most major U.S. stock indices, including the S&P 500, Dow Jones Industrial Average, NASDAQ, Russell 1000, and Russell 3000 closed lower in March. The Russell 2000 Index, a measure of small capitalization stocks, stood out with gains in March. In the latter part of March, the S&P 500 came close to retesting the lows from the 10% sell-off in early February, but the index bounced off those levels to close out the month. However, this late month move was not enough to overcome all the declines that occurred earlier in the month, and this index closed out March and the first quarter in negative territory. While not matching the levels from February, volatility remained elevated in March after it had been rather dormant during 2017. International stocks struggled in March as well, although emerging market equities still enjoyed positive results over the first quarter of 2018. 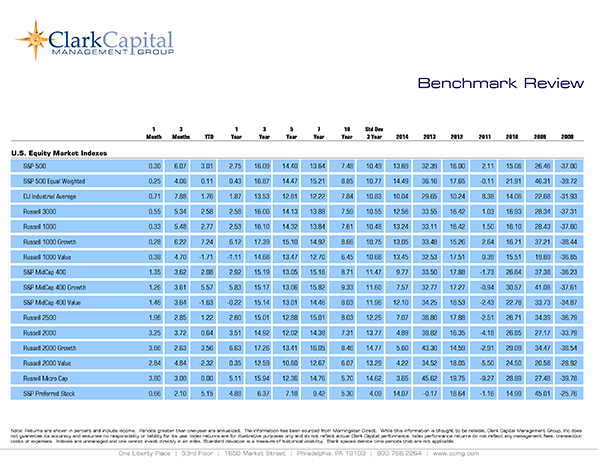 One recent trend reversed as small cap U.S. equities outperformed large caps in March and on a year-to-date basis. Growth stocks still hold an advantage over value stocks for the first three months of 2018, although results were more mixed for the month. The notable rise in 10-year U.S. Treasury yields that began 2018 paused in March. After closing 2017 near 2.4% and hitting a multi-year high of around 2.95% during February, the yield on the 10-year U.S. Treasury moved lower in March, closing the month at about 2.74%. Overall, this decrease in interest rates led to most fixed income sectors enjoying positive returns in March, despite most remaining in negative territory year to date. The Bloomberg Barclays U.S. Aggregate Bond Index and U.S. Treasuries turned in solid gains in March, but high-yield bonds declined. Conversely, year-to-date results were largely negative across most fixed income sectors, but high yield bonds (while negative) still showed some of the best relative performance compared to longer-dated U.S. Treasuries and investment grade corporate bonds. The economy continued to grow in February. The labor market saw an exceptionally strong reading of 313,000 job additions in February, well above consensus expectations of 205,000. Additionally, 39,000 more jobs were added to the original payroll numbers for January. The unemployment rate held steady at 4.1% when it was expected to tick modestly lower to 4.0% as the labor force participation rate rose unexpectedly in February. Average hourly earnings came in below expectations. The third reading on fourth quarter 2017 GDP was released in late March and it surprised to the upside coming in at an annualized growth rate of 2.9%. Once again, the ISM Manufacturing Index and ISM Non-Manufacturing Index remained elevated and continued to show solid economic growth in February. The Federal Open Market Committee met in March under the leadership of new Chairman Jerome Powell and policy rates were increased as expected.